Now that Microsoft's played part (if not all) of its hand and rolled out a smaller, cooler, quieter Xbox 360, how do things stack up against the competition? Our latest build-it-yourself chart (see our pre-E3 chart here) won't tell you what to buy, since that depends what you're after, but it will give you a sense for who's overcharging (though I will say--sneak preview--that after years of high upgrade prices, Microsoft's finally carried its fully-loaded Xbox 360 down from the mountain). Not listed here: Microsoft's confirmed $199 Xbox 360 budget-class model, coming this fall, probably without wireless and a smaller hard drive (or no hard drive at all). 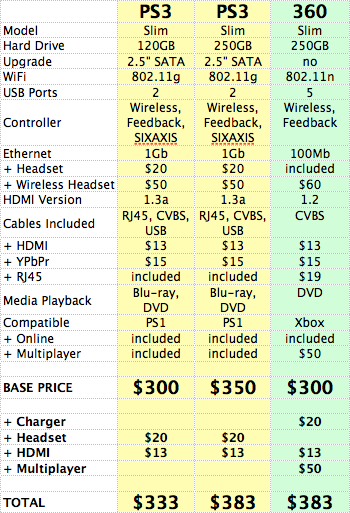 Note that prices for systems and components were grabbed from Best Buy, accessed June 22, 2010. Hard Drive: The PS3 hard drive can be user-swapped for any 2.5-inch SATA drive (e.g. a 500GB drive retails for $70 to $90) while the Xbox 360 remains proprietary, capped at 250GB, and Microsoft-locked. Wireless: As noted in the chart, the PS3 employs internal 802.11g wireless, while the Xbox 360 now also includes internal wireless more or less gratis (the external USB dongle cost $100) and at the hypothetically faster 802.11n spec. Controller: The PS3 controllers charge internally, while the Xbox 360 comes with a pair of standard AA batteries. Microsoft's "Play & Charge" kit, which includes the charger cable and NiMH battery pack, costs $20. Video: The PS3's HDMI connection adheres to the 1.3a spec, which yields higher data transfer speeds, a new expanded color format called "Deep Color," automatic audio syncing (lip syncing), and Dolby TrueHD and DTS-HD Master Audio support. The Xbox 360 supports the older HDMI spec 1.2. In practice, the only functional difference given current TV and broadcast limitations would be the Dolby/DTS-HD spec, and then only in relation to lossless, uncompressed audio situations, such as Blu-ray video playback. For more on this, see here. Online: The new Xbox 360 comes with Microsoft's Xbox LIVE Silver membership, which essentially allows you to create a Gamertag and message friends. If you want Netflix, Facebook, Twitter, and online multiplayer support, you'll have to upgrade to Xbox LIVE Gold, which costs $50 a year, e.g. $250 for five years. The PS3 currently offers online services including competitive multiplayer at no additional cost, though a premium service dubbed "PlayStation Plus" is in the offing. Acronyms: RJ45 is shorthand for Ethernet. CVBS stands for "Composite Video, Blanking, and Sync" (the lowest quality video cable, only a step above coaxial RF). YPbPr is shorthand for Component Video, and refers to the discrete green, blue, and red video plugs (component is the second-highest quality video cable, next to HDMI). For some reason Microsoft only includes the CVBS cable in the new Xbox 360, where it used to include both HDMI and YPbPr. Disclaimer: I've said it before, I'll say it again: Remember that the above chart doesn't gauge the "soft" value of features like Xbox LIVE or PlayStation Home, or how having a network of friends clustered on a given system influences purchases. Summary: The playing field for all-in system purchases from a component-driven standpoint just leveled out dramatically.